Ethylene Glycol based water solutions are common in heat-transfer applications where the temperature in the heat transfer fluid can be below 32oF (0oC). Ethylene glycol is also commonly used in heating applications that temporarily may not be operated (cold) in surroundings with freezing conditions - such as cars and machines with water cooled engines. Ethylene Glycol is the most common antifreeze fluid for standard heating and cooling applications. Ethylene glycol should be avoided if there is a slightest chance of leakage to potable water or food processing systems. Instead solutions based on propylene glycol are commonly used. Specific heat capacity, viscosity and specific weight of a water and ethylene glycol solution vary significantly with the percent of ethylene glycol and the temperature of the fluid. Properties differs so much from clean water that heat transfer systems with ethylene glycol should be calculated thoroughly for actual temperature and solution. 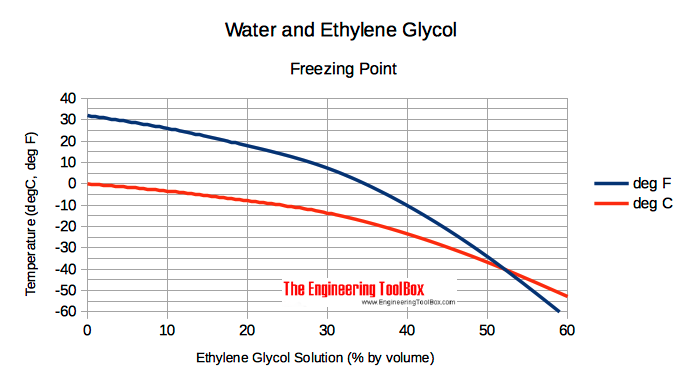 Due to possible slush creation, ethylene glycol and water solutions should not be used in conditions close to freezing points. Note! The dynamic viscosity of an ethylene glycol based water solution is increased compared with the dynamic viscosity of clean water. As a consequence the head loss (pressure loss) in the a piping system with ethylene glycol is increased compared to clean water. Note! The specific gravity of ethylene glycol based water solutions are increased compared with specific gravity of clean water. A heating system with liquid volume 0.8 m3 is freeze protected with 50% (by mass, mass fraction 0.5) ethylene glycol. The installation temperature of the system is down to 0oC and the maximum medium operation temperature is 80oC. From the table above we see that the density of the solution at installation temperature can be as high as 1090 kg/m3 - and the medium density at operation temperature can be as low as 1042 kg/m3. Note! The specific heat of ethylene glycol based water solutions are less than the specific heat of clean water. For a heat transfer system with ethylene glycol the circulated volume must be increased compared to a system only with water. In a 50% solution with operational temperatures above 36 oF the specific heat capacity is decreased with approximately 20%. The reduced heat capacity must be compensated by circulating more fluid. Note! The density of ethylene glycol is higher than water - check the specific gravity (SG) table above, so the net impact on the heat transport capacity is reduced. Example - the specific heat of an ethylene glycol water solution 50% / 50% is 0.815 at 80 oF (26.7 oC). Specific gravity at the same conditions is 1.077. The net impact can be estimated to 0.815 * 1.077 = 0.877. Automobile antifreeze solutions should not be used in HVAC systems because they contain silicates that may cause fouling. Silicates in automobile antifreeze are used to protect aluminum engine parts. Note! Distilled or deionized water should be used for ethylene glycol solutions. City water may be treated with chlorine which is corrosive. Systems for automatic makeup water should not be used since a leakage would contaminate the environment and dilute the antifreeze protection of the system. For full table with Boiling Points - rotate the screen! Engineering ToolBox, (2003). Ethylene Glycol Heat-Transfer Fluid. [online] Available at: https://www.engineeringtoolbox.com/ethylene-glycol-d_146.html [Accessed Day Mo. Year].